Much of the first hour is spent showing Ben meeting with a variety of people. He is shown alternately in a suit, as an IRS auditor, and in a lonely motel room crying miserably. In his suit he meets with a blind man named Ezra Turner (Woody Harrelson), an old friend (Barry Pepper), and a young woman named Emily (Rosario Dawson) all while his brother (Michael Ealy) tries to get a hold of him on the phone. But Ben doesn’t want to talk to anyone about himself. He searches people, asking them probing questions. He wants to know if these people are good people: he’s auditing their lives, not just their finances. It’s clear that he wants to help people, if they are deserving. He has suffered horribly in his past, perhaps committed some deed for which he cannot forgive himself. These selfless acts, helping an elderly person, freezing one’s accounts so they can’t be collected, are his acts of penitence to gain forgiveness. Then he becomes more involved with Emily, a woman with an enlarged heart whose time on earth is limited. She is lovely and wants to live a longer life and experience more than her short time will permit her. Eventually she and Ben become more deeply involved, though he still isn’t able to explain his past to her. This is about where the movie stalls, becoming predictable while the cheesiness and soppy melodrama mounts. In the fractured timeline of the first hour Ben’s motives are a mystery, pieced together slowly. As the movie starts to focus on his relationship with Emily the mystery is halted until the very end, where every motive is clearly and disappointingly revealed. There are a number of problems with the film, in addition to the unfortunate change in pace at the halfway point. Even toward the beginning of the film Smith has trouble effectively portraying an emotionally broken and destroyed person. He comes off as a whiny teenager at times, emo to the core. Even when he’s committing his deeds of niceness he seems fake and forced, as if he’s unsure whether or not he wants to be a benevolent Santa Clause or if he has ulterior motives. Rosario Dawson does a better job, if only slightly. She manages to look sickly and unattractive in the hospital, as any person (even a famous movie star) ought to when near their death bed. Some of her mood changes later in the film are surprising and don’t seem true to her character. Neither actor is entirely to blame, however. The script is weak and many of the lines seem dishonest to the characters, as though no one in real life would ever utter them. The movie makes reference to a number of Biblical phrases, and Ben’s search to help others seems to be a working out of his faith, through deeds. But the film is so utterly bleak and dismal that even a tacked-on coda does nothing to make the events of the ending more palatable. Not that there is anything wrong with a bleak film, but when the depressing impression is so void of insight or meaning the film loses its impact. The core story is interesting, and might have been more effective had it been presented more linearly. More time to empathize with Ben and his plight might have made his eventual decisions more understandable. However, the film is set in such a weird reality (one where you can run to the hospital from home, or walk to the hospital from another home) that it seems almost like science fiction. One interesting element is how the film treats race, or, rather, how it seems to entirely ignore it. Thomas is black, successful in his career, and ravaged by his past. His best friend is white, and married to a black woman, but no mention is made of it. It appears that the film might be trying to make a point by not referencing anything to do with race, but this almost seems dishonest in how blatantly it is portrayed. 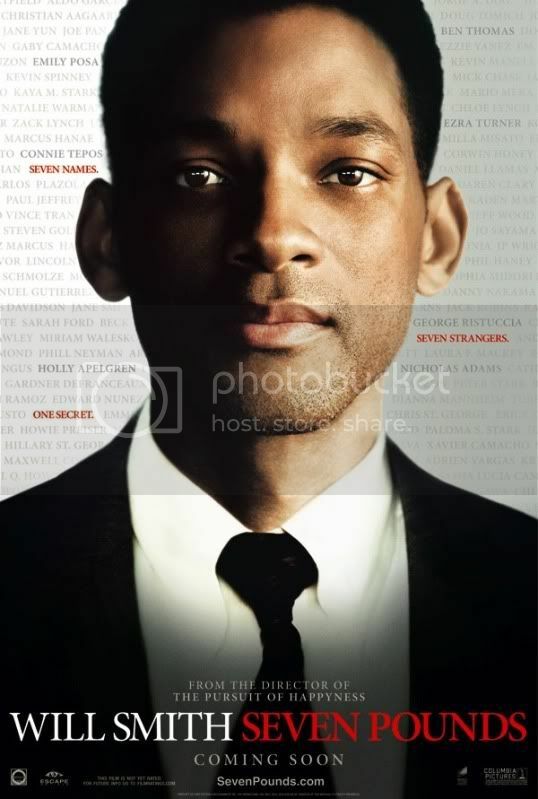 Seven Pounds is not a total wreck. It usually looks good, and has a soundtrack that is not too intrusive even though it aids in the film’s overly dramatized sections. Some people might be carried away by a film like this, and if so I would recommend at least two boxes of Kleenex. Other viewers, like myself, will be disappointed in its turn toward normalcy halfway through, ignoring any sense of mystery it has built, and in the overly wrought and cheesy melodrama that it tries to sell.